The Irish League is back on Sky Sports. A new five season deal between the broadcaster and the Northern Ireland Football League begins in just a few day’s time as the cameras will show two matches this weekend. On Friday evening, Sky Sports will broadcast from Solitude as Cliftonville host Glentoran in the Danske Bank Premiership (kick-off 7.45pm) before rolling across north Belfast to show the NI League Cup final the next day between Ballymena United and Carrick Rangers (kick-off 5.30pm). 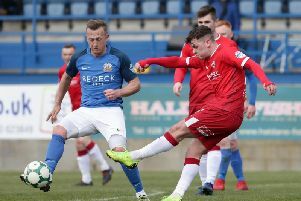 The live broadcast agreement, which runs until the end of the 2021/22 season, will see five Danske Bank Premiership fixtures and the NIFL League Cup Final broadcast each season. This weekend’s double header will be followed by further live games in March and April. NIFL Managing Director, Andrew Johnston, is excited about the new long-term agreement. “This is fantastic news for fans of Irish League football and I am delighted that the Danske Bank Premiership and the NI League Cup Final will be back on Sky Sports,” he said. “The coverage that Sky provide is fantastic, it is fantastic platform to promote our league, our clubs and our players to a wider audience of football fans across the UK and around the world. I would like to place on record our appreciation of the assistance provided by the Irish FA and UEFA in developing this agreement.